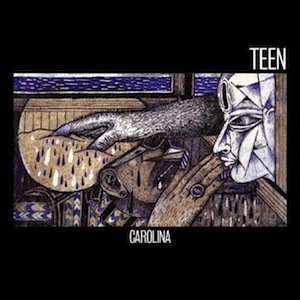 Carolina is the new EP from Brooklyn’s Teen, following up their 2012 LP In Limbo. Fronted by ex-Here We Go Magic keyboardist Kristina (Teeny) Lieberson, the quartet is rounded out with sisters Lizzie and Katherine, and Jane Herships. The title track opens big and bright with synth flourishes before expanding into gale of sound for the last minute, then ending abruptly. The EP alternates between hypnotic and grinding, finding its best combination of the two on “Glass Cage,” which, after an ethereal opening, segues into a churning guitar conclusion. It’s the keeper of the record. Closer “Paradise” comes on like vintage Electrelane, spiked with elliptical lyrics, before trailing off into the echoes of forever. The line “How will you ever return, once you’ve tasted bourbon in food?” goes straight to our heart here at The Nest.